Bonsai require care similar to most all plants grown in containers. What follows are general tips. The internet offers a plethora of care guides as well. 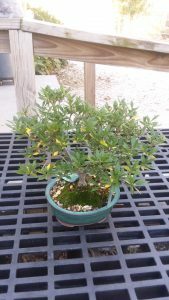 Consider joining the Houston Bonsai Society, www.houstonbonsaisociety.com, to meet others who share your interest! Feel free to bring your tree to the store anytime! 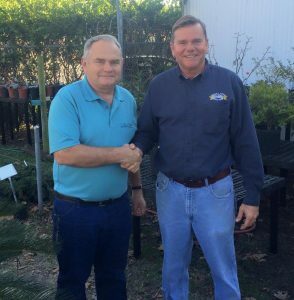 Our Owner Ken is a bonsai enthusiast who is eager to help with your tree care! Our hope is that your tree lives for years to come! Watering bonsai to maintain plant vitality is an important key to your success. A good soaking of water is needed BEFORE the soil dries completely. Check your tree’s watering at least TWICE daily to stay familiar with soil condition. 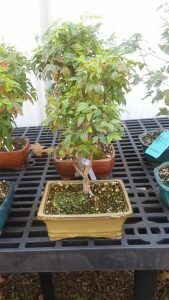 Bonsai are generally grown in shallow containers that include porous soils which do not store enough moisture in reserve to keep trees watered for long periods. Don’t wait until the tree stresses from lack of moisture. One sign the tree needs watering is when the surface of the soil turns a lighter shade. Another is to use your fingers to feel the soil surface for drying. The best time to water is morning so your tree will have plenty water available during the day when conditions cause the soil to dry rapidly. Check the tree again in the evening. Each time you water, make sure the tree receives a good soaking. Water should drain freely from the drain holes on the bottom of the pot. A moisture tray is helpful for some trees, but roots should never stand in water for long periods of time. You can over-water or not water enough if simply watering on a convenient schedule. Only water when the tree needs it. Sunlight is essential for most all trees and knowing the light requirement that your tree prefers is most helpful. Most trees require at least 4 hours of direct sunlight daily. Because of Houston's intense heat, morning sun is preferred with some afternoon protection especially in Summer. Always keep the tree outside when weather permits for the best results. Foliage which stays compact is a good indication of proper exposure. Houston's intense sun during the hottest period of the year may burn foliage as well as over-heat pots to the point of root damage. Relocating the tree to a shadier location may be necessary in Summer. Feel free to bring your tree indoors anytime to admire it, but do so for only a few days at a time. Then place it back in its outdoor location. Temperature depends on the type of tree you own. Keeping the tree at the proper temperature also is essential. Tropical trees prefer a maintained temperature of 60 degrees F and above. Keep these trees warm year round. Deciduous trees and conifers do well in both warm and cold weather, and most need an annual rest period (dormancy) that begins when temperatures drop below 50 degrees F in the Fall. Protection from excessive hard freezing is rarely necessary. Some safe locations to over-winter on the coldest days may include garages, unheated porches and sheds. Keep trees watered and maintained with adequate sunshine even during Winter. Feeding your bonsai is necessary for good plant health. There are many plant fertilizers on the market, so in time, consider experimenting with different ones. Starting off though, feed the tree weekly when it's actively growing with a general-purpose water-soluble fertilizer (ie. 20-20-20). Always use fertilizers at half strength to keep from injuring the tree's roots. As the seasons change consider changing the feeding program. Decrease or stop fertilization during the winter months when growth slows down or stops. 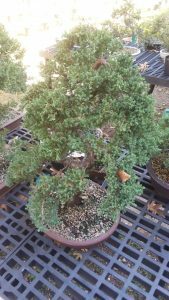 Pruning/Repotting your bonsai is necessary to achieve the desired size and shape. Pruning takes place during active growing periods. 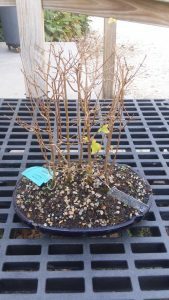 Repotting occurs in late Winter to early Spring. In the beginning, we recommend you seek help for these important tasks.